With snow still on the ground, particularly in our garden where the kids’ sledge has compacted last weekend’s fall into an unshiftable and potentially lethal version of the Cresta Run, it’s hard to imagine that winter will ever end. Despite most of the landscape looking and feeling like the tundra, I have known for a while now that spring is just around the corner; and I know this because my seed potatoes have been chitting in the shed for over a fortnight and that means one of the rites of spring – potato planting – will soon be upon us. 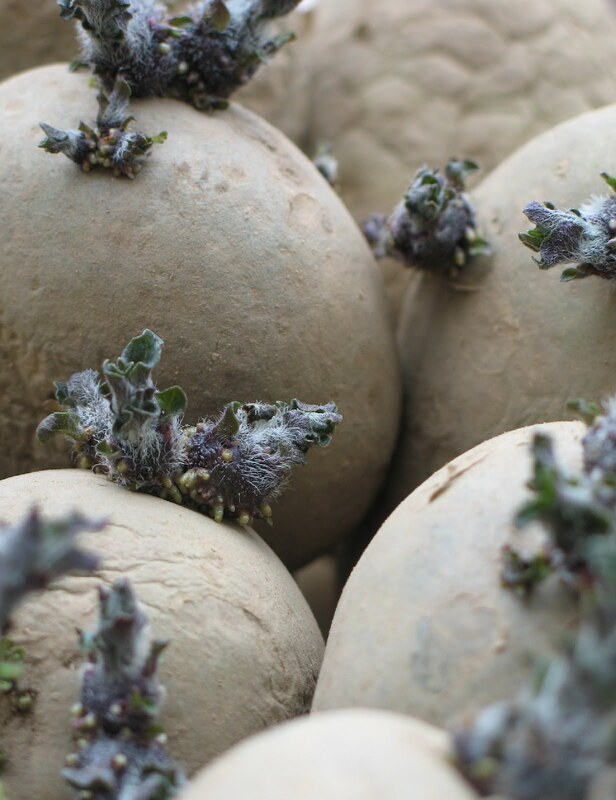 Chitting is the process of sprouting the eyes of the tubers before planting. It simply involves putting them in shallow, open trays or boxes with most eyes facing upwards. They need plenty of natural light – a shed with windows, a porch, a greenhouse – and a cool but not frosty temperature. Chitting takes 6 – 8 weeks, or until the sprouts are an inch or two long. Each of these sprouts will produce loads of potatoes, thereby contributing to the miracle of the multitude produced by one innocuous-looking seed potato. There is a school of thought that you don’t need to chit seed potatoes but chitting does seem to produce an earlier and larger harvest. Last year, I didn’t buy any seed potatoes until late February and, by the time of planting in March, they had been chitting for barely three weeks. As a result, my crop was slow to grow and the potatoes small in size; and holding off the harvest for as long as possible resulted in getting caught by the blight of early autumn. Determined not to be wrong-footed this year, I took an early trip to Lime Cross Nursery (support your local independent!) between Herstmonceux and Windmill Hill where they sell seed potatoes loose so you can mix your crop up a bit. I went for two varieties I have grown before and know to be reliable: Pentland Javelin for first earlies and Maris Piper for main crop; and I went for Charlotte as my second earlies. Earlies and main crop refer to the time of planting and lifting: earlies can be planted in mid-March, main crop in early April; earlies need 16-18 weeks before harvesting, main crop 18-20 weeks. Now I’m hoping that I might have a sight of the soil soon so I can start preparing; but with the temperature four below zero as I write this, even if I cleared the snow I don’t think it would take a spade just yet.